The EcoSmart GU10 6-Watt LED Light Bulb can be used to replace an traditional 50W halogen GU10 light bulb. This LED light bulb has an output of 400 Lumens and can last up to 25,000 hours, saving you up to $121 per bulb over the bulb's life. And it is ideal for use in track or recessed lighting fixtures. The EcoSmart GU10 5.3W(50W) LED Light Bulb can be used to replace an GU10 50W bulb. The daylight LED light has an 5.3-Watt of power and puts out 450 Lumens for up to 25,000 life hours. The energy-efficient LED bulbs offer you an estimated energy savings of $122 per bulb over the course of the bulb's life. This light can be dimmed for convenient light customization and helps conserve energy over the life of the bulb. The EcoSmart PAR20 6.5W(50W) longneck LED Light Bulb can be used to replace an PAR20 50W bulb. The bright white LED light has an 6.5-Watt of power and puts out 525 Lumens for up to 25,000 life hours. The energy-efficient LED bulbs offer you an estimated energy savings of $119 per bulb over the course of the bulb's life. This light can be dimmed for convenient light customization and helps conserve energy over the life of the bulb. The Ecosmart 60W Equivalent Daylight (5000K) B10 Dimmable LED Light Bulb with Classic Glass Filament (4-Pack) has a classic glass filament. This LED bulb provides daylight light similar to a 60W incandescent bulb while generating less heat. It uses 4.5W and should be used only on 120V, 60Hz circuits. 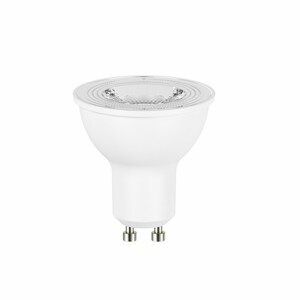 Light appearance: Brightness 500 lumens, Efficiency 111.11 Lumens/Watts, Energy used 4.5 Watts, Life 15,000 Hours, Colour rendering index (CRI) 80 CRI. 50W Equivalent Daylight (5000K) GU10 Dimmable LED Flood Light Bulb (6-Pack) - ENERGY STAR® The EcoSmart GU10 6-Watt LED Light Bulb can be used to replace an traditional 50W halogen GU10 light bulb. This LED light bulb has an output of 400 Lumens and can last up to 25,000 hours, saving you up to $121 per bulb over the bulb's life. And it is ideal for use in track or recessed lighting fixtures. 50W Equivalent Daylight (5000K) GU10 Dimmable LED Flood Light Bulb (6-Pack) - ENERGY STAR® is rated 1.0 out of 5 by 1. Rated 1 out of 5 by jule4099 from BEWARE NOT 50 Watt EQUIVALENT There seems to be a flood of cheaper led now in the market, but if you want a true 50 w equivalent still expect to pay 3 times more. A true 50 watt equivalent is 665 Lumens, check the lumens for a true value. Not what they are saying on equivalent Watt. I put these in my kitchen and threw out the box, money down the drain as the light is not powerful enough. Really disappointed in dishonest marketing.